Hello and welcome to TheCrimeHouse Veronica! Two of your crime novels have been published now. Congratulations! Thank you! It is very exciting to have had two novels published in such a short time. To write crime novels have always been my dream, and I will probably continue to write about Althea as long as there is someone who wants to read about her. You work part-time as a headhunter, can you please tell us a little about that? Yes, I work as Head of Research, meaning that I and my colleagues only have one task – to find candidates to the positions that the recruiters at the company work with. It means a lot of detective work and countless phone interviews. It is actually a dream combination in terms of jobs for me. Writing is a very introverted profession, which I actually like, but it is important to get new impressions and ideas as well, and the super social recruiting job is the perfect balance. The main character in your novels, Althea Molin, works as a profiler. Are there similarities between you two, are you stealing anything from reality? Yes and no. I try not to consciously steal traits from the candidates I work with; otherwise no one would want to talk to me. But I, just like Althea, is very observant and very fascinated by all types of people. I love to go to work in the morning; the subway is filled with fascinating people to be inspired by. I can rarely or never point to a single source of inspiration for a character. They are a quilt: a voice from someone I have eavesdropped to at the subway, a picture of someone from a newspaper, some mannerisms from someone I know, maybe something from a movie character and so on. Otherwise I think Althea and I only have two things in common, the inability to keep a pair of pantyhose whole for eight hours and the constant latte drinking. Can you please tell us a little bit about your second novel? My second novel is about social appearances – about how far we are willing to go to keep our social status and our self image. It is about several murders where the victims seemingly have no ties – except that the murders have been committed using the same gun, and all victims are found with a tarot card in their mouths. Althea discovers a connection to a computer security breach at the Lindstein Bank where her best friend Emelie is responsible for security. Unfortunately the police refuse to believe her. Althea’s life is not made easier by the fact that her overbearing mother decides to come to Stockholm and the relation with her boyfriend – policeman Rickard Magnusson – is a bit shaky. There are many out there who dream about writing a novel, but do not dare to take the step. How does it work to combine the writing with a professional life; how does the writing process work? The most important thing to succeed in writing part time is to take it seriously. Make time for it, how much or little does not matter, as long as you make time and make sure that the writing never comes last on the priority list. The laundry can wait a few hours longer, I promise. I start by planning and doing research. I can do that wherever – brainstorming on the bus, reading FBI reports in the bathtub, thinking about characters during lunch, but also during longer sessions to piece together the ideas to a whole, to a number of scenes. Then when I sit down to write, in longer and more focused sessions, I know what is going to happen and what persons will be involved, that gives me freedom to be more creative. What components are needed for a good criminal novel in your opinion? Wow! If I think about myself as a reader of crime novels I think that a good novel needs to contain insightful, colorful characters. I want to see the human in both ”evil” and “good.” Last, but not least, I prefer to be a bit surprised by how the story develops. What is your “crime novel background” – there are rumors about a “romance” with Sherlock Holmes? Yes, I have to agree that it is true! When I was younger Sherlock Holmes was my ideal, and I dreamt about marrying a man like him (I ignored the little drug problem and the never ending violin playing)! I have been completely focused on the crime novel genre since I was little; I read everything from English classics like Christie and P D James to hardboiled American thrillers like James Lee Burke and Icelandic melancholy like Arnaldur Indridason. I like almost all types of crime novels, as long as they are focused, smart and have a core of humanity – not just brutality. 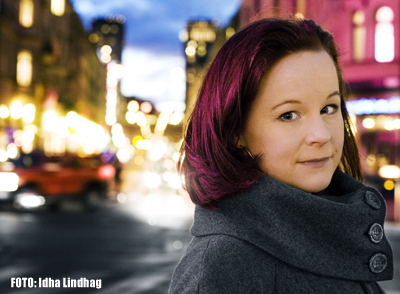 Swedish crime writers are really popular right now. Do you have a favorite of your own, and if so why? I am very fond of Mankell and Nesser, but I also love older crime novels, e.g HK Rönnblom, Stieg Trenter and Sjöwall-Wahlöö. I like them because they are simpler than modern crime novels, without being less complex. They are often lighthearted on the surface, but with a fascinating dark undertone. Yes, I am working on the third novel about Althea. I have also started a blog (in Swedish) where I will collect all the material and thought about the novel. My hopes are that the blog will give some sort of, slightly confused, insight into the writing process. TheCrimeHouse thanks Veronica and wishes her good luck in the future. We will follow her blog and the work with the next novel with great interest.